Sixty percent of individuals over the age of 20—or 58 million people in the U.S.—are overweight. As the obesity epidemic continues to grow, many Americans are researching the benefits and complications of weight-loss surgeries. Weight Loss Surgery For Dummies, 2nd edition is the most up-to-date and authoritative guide to understanding the impact of surgical weight-loss before, during, and after surgery. Weight-loss surgery is often an overweight person's last resort, and it comes with many risks, questions, and fears. So how do you know if it's right for you? Weight Loss Surgery For Dummies gives you expert guidance on knowing whether you qualify for the procedures, advice on choosing the best center and doctor, and trusted information on evaluating the risks involved. Plus, it helps you plan to finance the procedure, prepare for surgery, and achieve the best results as you adjust to a new diet and lifestyle post-surgery. If you or a loved one is considering gastric bypass surgery, Weight Loss Surgery For Dummies gives you everything you need to decide if it's the right course of action, what to expect during recovery, and how to ensure the best results through healthy eating behaviors and regular physical activity. Marina S. Kurian, MD, is a weight loss surgeon at NYU Medical Center. Barbara Thompson is a nationally recognized speaker who brings hope to the dangerously obese. 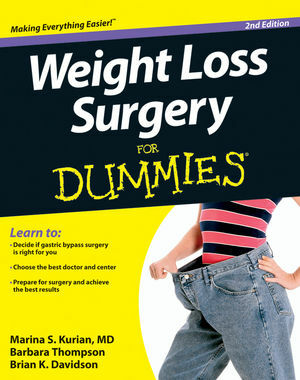 Brian K. Davidson is the coauthor of Weight Loss Surgery Cookbook For Dummies.